Chalice is proud to be associated with Catholicism 201. By sponsoring a child through Chalice you will not only be helping to change a life, but will also be supporting a wonderful organization. 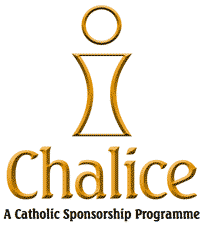 Chalice is an independent Canadian Catholic sponsorship organization with headquarters in Nova Scotia. Chalice sponsors more than 40,000 children at 46 sponsor sites around the world regardless of race, creed or religion. We strive to alleviate the effects of poverty by offering an effective and trustworthy sponsorship program that reflects God’s love and mercy in the world. If you would like more information on Chalice or would like to sponsor a child, please visit our website at www.chalice.ca by clicking on the logo or contact us at 1-800-776-6855. In fidelity to a calling to bring the Good News of Jesus Christ to a world in desperate need of Him, the John Paul II Media Institute (JPIIMI) seeks to fulfill this mandate through education in, and production of, media that advances the Kingdom of God. The JPIIMI is thus both an educational institute and a professional production house that offers reasonably priced, high-quality media services for churches and church groups through a network of Christian media professionals and highly trained volunteers, all of whom are motivated by faith. To date the most far reaching production associated with the JPIIMI has been Catholicism 201. In actuality this Catholic follow-up to The Alpha Course predates the formation of the JPIIMI, both as concept and a production - hence the lower quality camera work.